JUNO-Gi, Digital Synth from Roland in the Juno series. Roland U.S. announced the Juno-Gi Mobile Synthesizer with Digital Recorder. The Juno-Gi features a new sound set designed for live performance, built-in eight-track digital recorder with 64 virtual tracks, and integration with digital audio workstations through its built-in audio interface. The Juno-Gi runs on AC power or batteries. Onboard are about 1,300 sounds optimized for live playing. Sounds are organized into Live Sets, allowing four-way splits and layers with ease. Tone Category buttons make it simple to navigate the massive sound library, while the mod, pitch bend, and D BEAM controllers are designed to let players add expression to sounds as they perform. The Juno-Gi also includes a built-in eight-track digital recorder for song production, with transport controls, mix faders, and a dedicated rhythm machine track. Record directly to a single SD card for up to 192 hours of possible recording time with a single 32 GB card. Juno-Gi sounds can be recorded along with a vocal mic or guitar when connected via the rear-panel XLR microphone, guitar, and line level inputs. Effects processing is available for live recording, mixing, and mastering, including BOSS GT-Series professional guitar effects and effects designed for vocal processing. The Juno-Gi also functions as a USB audio/MIDI interface. Users can record Juno-Gi sounds and play software instruments in any DAW, and also record vocals and guitars while using the Juno-Gi's onboard effects. In addition, the Juno-Gi comes bundled with Cakewalk's SONAR 8.5 LE software. The Juno-Gi is expected to ship in October with an MSRP of $1,199.00. 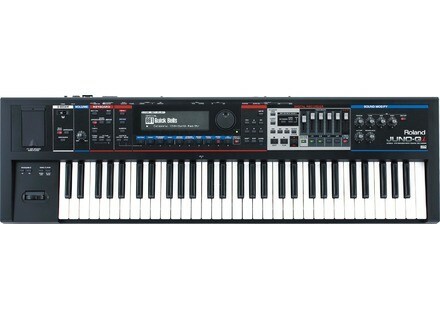 Yamaha MOTIF XF Yamaha’s Motif XF keyboard workstation offers up to 2GB of Flash memory expansion. Korg PA 800 Elite Korg announced the Limited Edition PA 800 Elite, the newest in its line of sophisticated Interactive Workstation keyboards. Novation UltraNova UltraNova is an analogue-modelling synthesizer designed "for everyone: from first-time synth purchasers to keyboard addicts."